On Thursday we attended the Drum Marketing Awards and were thrilled to be presented with the ‘Digital Strategy of the Year’ award in conjunction with Gravity Road. 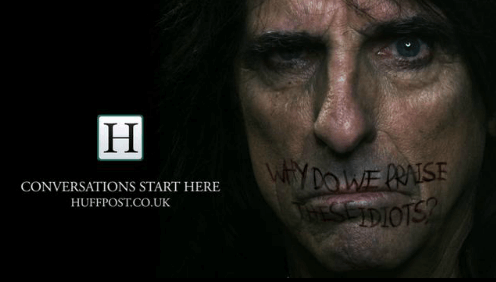 This followed our online campaign for The Huffington Post, which featured celebrities including Alice Cooper, Richard Branson, Will Carling, Cherie Blair and TV presenter Cherry Healey. I thought it might be interesting to talk a little bit about the digital strategy we used for this campaign. What was the objective of the campaign? To drive 1 million unique visitors to the Huffington Post website. What was the concept behind the ads? The concept behind the ads was devised by Gravity Road and focused on the theme: ‘Conversations Start Here’. The ads used the most powerful or controversial statements from the Huffington Post blog, written across the famous face of the person who wrote the article. The idea was that the statements would be real conversation starters, presenting an opportunity for readers to get involved and engage with the blog in a very personal way. What digital strategy did we use? The digital strategy atom42 employed involved partnering with websites whose following would potentially be interested in the topic of each article. We partnered with sites which would have a following that would be interested in either the celebrity or the topic, ensuring that wherever the ad showed it would be to a suitable audience. We also ran a large amount of pre-roll activity as well as standard formats, maximising engagement by targeting news-based content with a stand-out creative. Which partnerships did we use? There were loads of partnerships involved – too many to mention here! For example though, for the Richard Branson advert we partnered with the Financial Times, while for Will Carson we partnered with rugby sites. We succeeded in our goal of delivering over 1 million unique visitors to the Huffington Post website during the course of the campaign. You can view a selection of the campaign creatives here.